Last year’s celebratory release The Worlds of Doctor Who weaved a linking story through various spin-offs from the Big Finish Doctor Who range. The Worlds of Big Finish follows a similar premise, this time telling a story linked by six half-hour episodes of Big Finish’s original ranges. It is not the first time some of these characters have interacted given that despite their status as original series, several of these characters made their debuts within the Doctor Who universe. Dorian Gray first appeared in the Bernice Summerfield play Shades of Gray and went on to interact with Sherlock Holmes in the 2012 release Ghosts of Christmas Past. Each episode is presented as a standalone with its own unique title theme and all a very much in keeping with the series they are part of. All six episodes have been written by David Llewellyn who manages the overall continuity extremely effectively. He also captures the widely varying styles of the six ranges very well. The set begins with Graceless: The Archive, there are some very obvious continuity pointers which place this story during the third (and until recently seemingly final) series featuring Abby and Zara. Any listeners who have not heard Graceless before may find themselves feeling initially confused however once the story proper gets going it proves to be an enjoyable murder mystery set in a vast library of the distant future. Janson and Doddington reprising their lead roles have a great rapport so despite the series having appeared to reach a definitive ending in 2013, this listener is pleased to learn that Graceless IV has been commissioned to be released next year. The story ends with an important book being transported back to Earth in the mid-nineteenth century, thus setting the scene neatly for the next episode. Sherlock Holmes: The Adventure of the Bloomsbury Bomber is a neat little adventure in which the world famous consulting detective comes out of retirement in 1911 to assist his brother Mycroft by investigating a series of bookshop bombings in Bloomsbury. A neat continuity touch is the casting as Mycroft of David Warner, who had previously played the character in the 2008 Bernice Summerfield play The Adventure of the Diogenes Damsel. The initial scene between Nicholas Briggs and Warner as the two sparring brothers is possibly one of the highlights of this boxset. The outcome of the adventure is not entirely satisfactory for Holmes but it dovetails very neatly into the next episode. Dorian Gray: The Feast of Magog picks up the ongoing story in 1927 and relocates the action to Tredegar House near Newport, which will be familiar to filming location savvy Doctor Who fans. A character from the previous episode returns, still intent on recovering a certain book which has terrible consequences. However, like Sherlock Holmes before him, Dorian remains in the dark as to the truth behind the ongoing mystery. If anyone from the worlds of Big Finish were to save the Earth from a mysterious threat from another universe, the last person you would expect to fulfil that task would be the trans-temporal adventuress Iris Wildthyme. However, despite a lighter, more comedic tone than the three darker episodes that have preceeded it, Kronos Vad’s History of Earth (Vol. 36,379) proved to be possibly the most enjoyable of all the six episodes. Katy Manning’s Iris gets some genuinely funny lines and whilst the plot may seem a little linear it does serve to tie up a notable loose end from an earlier episode and set events in motion that will be picked up in the remaining two parts. And so we reach the penultimate episode, Vienna: The Lady from Callisto Rhys. This listener has not encountered Vienna before so this means nothing to me. However, Chase Masterson’s bounty hunter character was likeable enough that I may consider reviewing her previous adventures in the near future. A few hundred years into the future on an inhabited Mars, Vienna is hired to track down a woman who has fled taking with her a certain rather important book. Typically there is an element of double-cross and a neat surprise appearance by a familiar voice to set the scene for the final part of the story. The story finds its conclusion in Bernice Summerfield: The Phantom Wreck. I’ve listened to all of Bernice’s many audio adventures that have been released since 1998 and so Lisa Bowerman’s presence is naturally reassuring. This final episode very much belongs to her and to Terry Molloy’s Captain Quinn. As an individual episode this makes for an enjoyable listen but without wanting to spoil the ending for the whole boxset this listener found the denouement to be slightly disappointing. A small consolation is to be found by the story concluding with an extended version of a new arrangement of the Bernice Summerfield theme tune which is a definite improvement on the most recent of its many iterations. Overall, The Worlds of Big Finish fulfils its brief cleverly and avoids causing any headaches by keeping all the main characters within their respective continuities, rather than having period based characters such as Sherlock Holmes travel to other worlds. Each of the standalone episodes works well as an advert for the six ranges they represent and the linking story provides a satisfying listen for Big Finish fans. Big Finish love stories. They also love to join the dots and play 'What If'. The urge to revisit a half-developed idea which might briefly have played upon the mind of a harassed TV writer before finding its way into one of your favourite stories can be irresistible. And who can blame them? They have the entire canon of Classic Doctor Who as their sandbox. You'd probably do the same, the only restrictions are availability of cast, mostly through mortality - and for some characters death is not proving an end, as heard in the Lost Stories, Early Adventures, and the forthcoming Third Doctor Box Set. In this, the opener of the latest series of Fourth Doctor Adventures, self-proclaimed biggest fan of Death to the Daleks Nick Briggs decides to put some flesh on the bones of the Exxilons, a race that we know slipped into savagery after building their great city. We know that the friendly ones live underground and glow a bit in the right light. We know that the unfriendly ones are grunting, spear-wielding primitives. And, we know that their great city, in the grand tradition of deserted great cities of Doctor Who, is a bit of a swine. Arriving on a developing planet, the Doctor, Leela, and K9 find themselves in the middle of a conflict between outwardly civilised humanoids, and some grunting, spear-wielding primitives who have been put to work building a mysterious structure. The Doctor and his companions are separated - he ends up with the primitives, meanwhile, Leela and K9 fall foul of the alien visitors and the malign power of their structure. However, just as you think you know where this is going, Writer/Director Briggs pulls the rug. The race with the spears aren't who you think they are, they're called the Tarl. The advanced civilisation who had the 'deal' with them (effectively ended by the death of the Tarl leader's son) are the race that will one day end up smashing up a Dalek with rudimentary weapons in a quarry. The Exxilons are using the Tarl to build a beacon to transmit across the stars and power their great city, a sentient city that they serve. It fills their heads, and gives them orders. It also attacks the minds of all that aren't Exxilons, and drains them, even the brains of Time Lords aren't safe. Aside from this though, they're a long way off the race depicted in Death to the Daleks, they sound nothing like the Exxilons from that story, and clearly look nothing like them either, as it takes a while for the Doctor to put two and two together, and tribe leader Ergu (Tim Treloar) has to do the name-dropping. How the Exxilons we meet in this story become that race is hinted at, but largely left to the imagination when one of their number, Trexa (Daisy Dunlop) rebels against the city, having bonded with the late son of the tribe leader. Dunlop is the strongest of the guest cast, giving a spirited performance as the spirited junior overseer who develops a conscience. Treloar is also good as Ergu, given the tough gig of having to portray a monosyllabic tribe leader he manages to strike up a good rapport with the Doctor, who he dubs "Everywhere Man". Tom Baker and Louise Jameson are both very good here, their performances are pitched just right. Several series and a few box sets in, one of the best Doctor and Companion pairings ever are quite possibly better than they ever were together on TV. The rest of the small cast are more of a mixed bag. Jacqueline King as Calura is perfectly good, but is unrecognisable behind a puzzling American accent, and Hugh Ross as villain Gethal is a bit all over the place - one minute coolly officious, the next he's chewing the scenery like a Drashig. Maybe Briggs will bring back the Exxilons to bridge the gap. Their loss of identity should feel tragic, but instead it feels like they deserve to fall as a civilisation and that's that - a little unfair for a species ruled by their evil city, who will one day end up as frog-eyed, bark-skinned savages when the city rejects them. The Exxilons aren't the nicest people, but there's surely a pay-off in the waiting. Still, minor quibbles aside, this is a strong season opener, both well-executed and pacey. To someone who is only a casual Doctor Who fan, the Zygons may not be the most familiar of The Doctor’s proverbial rogue’s gallery. For over 3 decades, their sole appearance was during a single story, 1975’s ‘Terror of the Zygons’. However, with the simulcast event that was The Day of The Doctor, this particular foe has made a rather remarkable comeback. The opening scene of Zygon Hunt, from Season 3 of the Fourth Doctor Adventures, is something reminiscent of Jurassic Park, aside from the otherworldly setting and the lack of actual dinosaurs. A team of big game hunters move through the jungles of the unnamed planet, shooting for sport any beast that they deem worth having a crack at. However, as the scene changes, we see what looks like a radar screen, with what can only be described as a large animal moving across it accompanied by a steady blipping noise. The Doctor and Leela land on the planet, with the usual spell of comedic dialogue, remarking that the weather is better this time round. As they move off into the jungle, Leela shows her Sevateem heritage by applying moss to a wound they find on an injured, pterodactyl-like creature. As Leela tells the creature to “rest a while”, it becomes apparent that her and The Doctor are being watched. A hunting party suddenly emerges and Mena, an engineer, points a gun at the time travellers. It is revealed that the “Solar Knights”, with Mena as their Commander’s Adjutant, are on the planet Garros on shore leave. While The Doctor and Leela converse with Mina, it appears as if they are being observed or listened to from an undefined location. The Doctor remarks that the reptilian species they just helped are “the largest inhabitants of Garros”. However, upon hearing a loud roar in the distance, they realise that this might not be the case. The Solar Knights pursue the large creature they are “hunting for sport” and it dives into a lagoon, so they take up positions to be ready when it surfaces. Mina takes The Doctor and Leela back to the lodge, whilst Saraton, the Knight Commander, arrives after a conversation showing the relationship he shares with his “little helper”. Saraton’s interrogation of The Doctor and Leela turns sour when the “savage” reveals what Mina recounted earlier, much to the Knight Commander’s derision. His moment of anger is cut short when Elunas, one of the officers, falls from a balcony. The fall, The Doctor believes, is not what killed him, but Saraton refuses to listen and the actual cause of death is almost glossed over. While The Doctor and Leela escape from Saraton’s guards, we see unidentified individuals watching over proceedings, seeming interested in the use of The Doctor’s sonic screwdriver. As The Doctor and Leela attempt to return to the TARDIS, they see Mina with one of the large creatures being hunted earlier. The beasts are seen to be feeding smaller creatures, which The Doctor identifies as Zygons. The Doctor and Leela watch the scene unfold, with a Zygon remarking that it is only a matter of time before they capture Saraton. The second episode opens with the attempted massacre of the Zygons, with Saraton believing they have hired The Doctor and Leela to kill him. Saraton is suspicious of Mina, but isn’t entirely sure of the underlying facts. The Doctor, meanwhile, has a “change of heart” and decides to solve the various mysteries that plague the planet after all, whilst making his way with Leela back to the lodge. They are halted in their progress by a Knight, who is promptly killed by a Zygon – demonstrating the Doctor’s revelation that they are “deadly at close quarters”. Leela is unsure why The Doctor then wishes to speak to Mina, considering the events that have transpired, but is eventually convinced. It emerges that Gregor is a war criminal and the Zygon plan is to destroy the human race for the sake of preservation. However, Mina experiences a crisis of conscience but still attempts to kill the time travellers as part of her mission. The Doctor and Leela are observed discussing their next move, as Leela states that she has a “cunning plan”. The revelations that make up the rest of the episode are well written and detailed, including a reference to the Loch Ness Monster! The final confrontation and negotiation attempts are intense, with Gregor not realising his end is nigh until it’s too late. The conclusion to the episode is heart-warming; with the Zygons realising that Earth is not the only place capable of settling Zygon life. With that, the time travellers depart the planet Garros, The Doctor and Leela realising that their companionship is of great importance to one another. The Doctor pushes a control on the Tardis console, landing them in their next adventure, unsure of when or where they have ended up. The vocal casting, as for the previously reviewed Season 3 Fourth Doctor Adventures, is well-suited. The Zygons are clearly distinct from the rest of the cast by their almost ice warrior like whisper with the planet’s own jungle life also being part of the immersive atmosphere. As for the Solar Knights, Ollerie and Elunas are acted well, with the Knight Commander encompassing every inch of the power hungry “mankind patriot”. The Doctor and Leela work well together, playing off of each other as has become customary, with the comedic misunderstandings and misinterpretations keeping the story flowing. The score fits the era well and whilst it is ever present, it makes itself known only when it wishes to, paralleling the Zygons themselves. In conclusion, this story is well crafted and leaves many questions unanswered for a reasonable length of time. In spite of the relative lack of action, the acting from all sides be it the Solar Knights, The Doctor and Leela, or the Zygons, is more than enough to make this adventure worth a listen. With or without prior knowledge of the Zygons this adventure should be an interesting new listen for any fan. However, background may be needed to make the principles explained easier to understand. The last of Gareth Roberts' trilogy of Fourth Doctor novels to be adapted for audio by Big Finish is great fun. It's rather a lot of great fun though, like a seven-course meal shared with friends. It's slow-burning, filled with good ingredients and fine conversation, but also a little hard to digest in one go. In Roberts' earlier efforts, The Romance of Crime and The English Way of Death he gave us first a fine trad-Who story, then something a little more out-there. This is a Season Finale story turned up to eleven, it's a lot of story to fit into the four episodes here. The cliffhangers in the book are preserved by John Dorney, rather than reorganising into an easier six-parter. It's all good stuff, with an excellent cast, but the episodes are rather long. The Well-Mannered War opens with the Doctor, Romana, and K9 landing in the middle of a war between humans and the tortoise-like Chelonians - a conflict that is taking rather a long time to get going, over a century in. As wars go, it's more like a mild inter-office dispute. The opposing sides get on well, they go for dinner together. The war even has its own tea-trolley. Being Doctor Who, of course this can't last - suspicious deaths on both sides lead to the war escalating into actual conflict, and the TARDIS crew are quickly separated and flung into variously investigating just who or what is behind this, and election campaigning, as K9 suddenly becomes rosette material. There are sinister carrion-flies, well-meaning robots, a fake civilisation, and an old foe to deal with. The overall effect is somewhat like a drastic rewiring of The Armageddon Factor, such is the amount of shared DNA. The dose of black humour is a little less than in The English Way of Death, this is more of a space-opera. The Doctor, in truth, takes a bit of a backseat for the middle episodes, whilst Romana and K9 take centre-stage. Both are flung full-pelt into proceedings with cowardly artist Menlove Stokes (Michael Troughton, reprising his role from The Romance of Crime) in tow, whilst the Doctor plays sleuth with the Chelonians. That said, although they're separated for so much of the story, the three leads are all on fine form. Tom Baker is rarely better than here, his slightly moodier performance recalling the Hinchcliffe years in places. Lalla Ward and John Leeson are simply a delight, their rapport carries the story through some complex exposition, but most of all it's the character work that stands out for all three. Dorney's skilful adaptation of Roberts' story perfectly recaptures that spirit of '79. 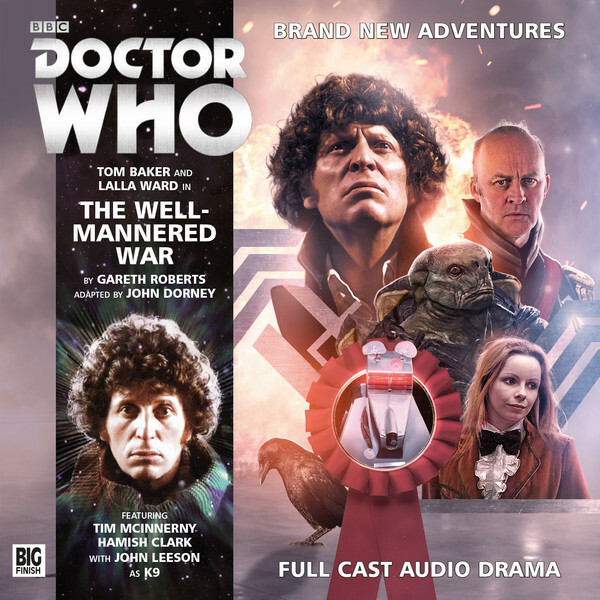 With a fine guest cast, and some strong direction, music, and sound design - The Well-Mannered War is a fine tasting menu of a Doctor Who story. As with the original, it ends on a cliffhanger, as the Doctor pulls the TARDIS out of reality to escape the Black Guardian. We never found out how this was resolved, but Big Finish have recently announced that The Fourth Doctor, Romana, and K9 are due to return for more adventures. Perhaps we'll finally find out what happened next.